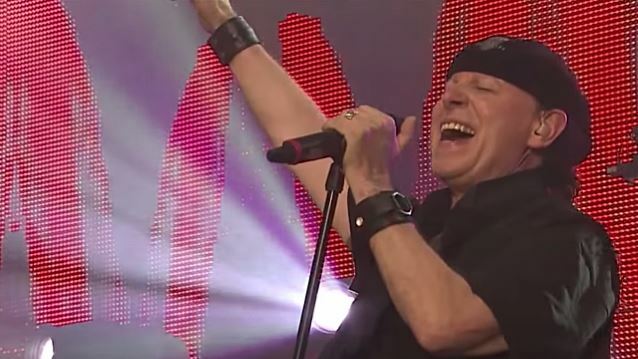 On October 23, Guillaume (Gegers) of SCORPIONS' French fan club Crazyscorps conducted an interview with SCORPIONS vocalist Klaus Meine. You can now listen to the chat in the YouTube clip below. A couple of excerpts follow (transcribed by BLABBERMOUTH.NET). Meine: "We're still passionate about it, we still love what we're doing, and we're still going strong. And we're still in the studio, we're still writing new songs, we go and record some material for a new album that will be out early next year. " "When we started a few years ago, when we thought about this album, to put out something for our diehard fans, we were thinking about maybe we'd find some good material [from] back in the '80s, and find some old diamonds and pearls [that were never fully fleshed out], and we did. But between 2011 and now, and even this year, the songwriting process has still been strong as a songwriting team. This is something, after so many years, that makes you feel really good about it. Because, with all those anniversaries around, there is hardly [any incentive] to put any music, and that's what we will do. There will be an album out next year, and it's not so much about old material, it's much more about a new album and new stuff, new songs." "We started [the new album writing process by] going back to the '80s and we picked some songs that were never finished, really, songs with working lyrics only. But some of those were pretty strong compositions, with great energy and stuff. And we picked some of them up. But, in the end, I think, we have a great balance between some of those '80s songs, like this early material — and those songs were never really finished and that was the reason they were never released…. Actually, I think we have two songs from the 'MTV Unplugged' where we said they would be cool if they would be on the album as electric versions, and the rest is all new. And that's a pretty good balance, I think." "Right now, as we speak, Rudolf [Schenker] and Matthias [Jabs] are in the studio recording guitars. More or less, I'm pretty much done with the vocals. And we'll soon go — in November — into the mixing process, and we're pretty much done. So this record will come out February, March… early next year." Meine: "Absolutely. I'm still in my life, I try to figure out, if we would stop touring tomorrow, I still could go to make records, in the studio, with the SCORPIONS or without. And would it give me the same pleasure? Yes. But then, when I think about it, I go, 'Ah.' But right now, it's a good balance. I can have both. I can go in the studio and we write new songs and we make a new album and we still go out there and play some shows. And right now we're putting a tour together for next year that will take us pretty much to a lot of places and a lot of countries… Like, in the last couple of years, when we did this farewell tour, and we said, even after two hundred concerts, we haven't played all the places we wanted to. And right now, we try to focus on places we haven't been in the last two or three years, and including a few favorite cities and countries, of course. So we're putting this together for next year, so it will be a celebration. It's like we invite our fans to be a part of this 50th-anniversary party. We'll throw a party and hopefully have some fun and hopefully people and fans enjoy the new album, and there will be a movie that will be out in February as well. So there will be a lot of things, and some shows coming up. I think we will be very busy next year." Meine: "This is an era for many for us that comes to an end sooner or later. And we can't go on forever. It's a miracle that we're still around. And it feels great, and as long as we can do it, we might be out there. I mean, all of us agree that cutting down the heavy touring and all this, it's definitely… We're at this point in our career right now when less is more. But it still feels good, and when you see that on this creative roll… That feels really good. And let's see what life will bring next year." Meine: "With James, you know, when he went through this unfortunate incident in Dubai earlier this year, we said, 'At this point, it's good if you take a break. Not so much for us, but for yourself. And not so much being the drummer of the SCORPIONS, but for yourself being a family man. And you should go into rehab and don't think about anything else but just try to clean out yourself and come back the same James we know for so many years that's been not only our drummer, but also our friend, and a great guy.' So, giving him that time, we played this whole stretch of shows this year with a great Swedish drummer, Johan Franzon. We just played very few shows this summer, this year. We played some unplugged shows here in Germany, and they were all great, they were all sold out, going to all the big arenas with this MTV project, with all those guest artists from Sweden and Greece; it was fantastic. And now, setting up next year, of course, we want James back, and we said to him, 'The door is open for you to come back. But first, it's up to you, and you have to take care about yourself, take it serious, go through a serious rehab, and then the door will be open for you.' And that's the case. And right now, James will play the drums on the new album — the recordings will take place in Stockholm coming up very soon — and I think James is doing everything to prepare himself to be in great shape and to be back next year for the tour."